AMSBIO, a leading global supplier of Chondroitinase ABC enzyme, reports on the recent publication by Hu et al. 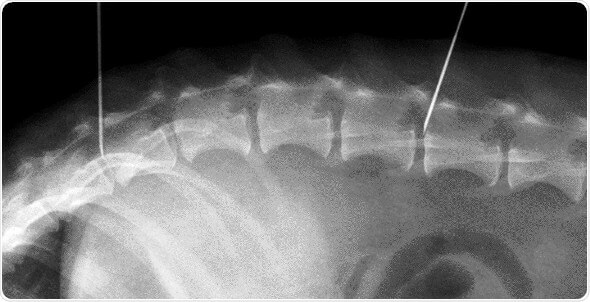 of the therapeutic efficacy of microtube-embedded Chondroitinase ABC on a group of dogs with naturally occurring spinal injuries. Developing new therapies for human spinal cord injuries is a challenging task because the damage is heterogeneous in terms of spinal location and severity. Ideally, a new therapy should work for survivors with acute injuries as well as for those with chronic injuries that happened less recently. This work, by Nick Jeffery and co-workers, describes a successful canine clinical trial of a drug therapy for chronic spinal cord injury, which demonstrated an improvement in limb coordination during walking. The pioneering new therapy used AMSBIO’s Chondroitinase ABC, a bacterial enzyme that removes sugar sidechains from extracellular matrix molecules including chondroitin sulfate proteoglycans (CSPGs) which are found within the intact and injured nervous system and act as potent inhibitors of axonal growth. CSPGs are involved in the inhibition of axon regeneration after various forms of damage to the Central Nervous System, including stroke or spinal cord injury. The enzyme Chondroitinase ABC purified from Proteus vulgaris degrades these CSPGs and has been shown to promote functional recovery and neural regeneration. AMSBIO has developed a highly purified Chondroitinase ABC enzyme supplied as a protease-free, carrier-free format, with low-endotoxin levels for use in neuroscience and regenerative medicine research. The trial reported here buffered the enzyme in trehalose and embedded it in lipid microtubes to render it heat-stable and long-acting at mammalian body temperatures.